Sons of The American Legion (SAL) is a program of The American Legion established at the national convention in 1932 in Portland, Ore. Since then, the Sons of The American Legion has assisted The American Legion with its programs and activities. In 2017, Sons of The American Legion attained an all-time high membership of 369,861 members nationally. The largest detachment (state level) has more than 61,000 members. There are trophies and awards given to detachments and squadrons for the largest membership, and the largest increase in membership. Although Sons has its own membership, the organization is not a separate entity. Rather, SAL is a program of The American Legion. Many Legionnaires hold dual membership in SAL. The Sons organization is divided into detachments at the state level and squadrons at the local level. A squadron pairs with a local American Legion post; a squadron’s charter is contingent upon its parent post’s charter. However, squadrons can determine the extent of their services to the community, state and nation. They are permitted flexibility in planning programs and activities to meet their needs, but must remember SAL’s mission: to strengthen the four pillars of The American Legion. SAL is more than just membership. 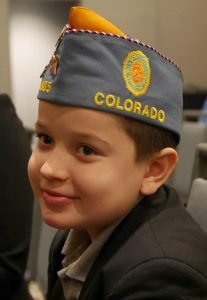 SAL members have worked together with The American Legion to promote children and youth programs, including the American Legion Child Welfare Foundation (CWF). In 2017, SAL raised over $594,400 for CWF. Since 1988, the Sons of The American Legion has raised over $7 million for the CWF. SAL members have donated over 455,000 volunteer hours in veterans hospitals throughout the country and raised over $1.6 million that has gone directly to the VA hospitals and VA homes for a variety of items including TVs, radios, medical equipment and clothes for the patients. Sons of The American Legion continues to provide services to those in need in the local communities, through programs that include fundraising events. The American Legion, Sons of The American Legion, and The American Legion Auxiliary form the Legion Family. Sons of The American Legion is assisting The American Legion and the Citizens Flag Alliance in their efforts to secure a constitutional amendment to protect the flag of the United States from desecration.